Rain, rain, rain. Blah, blah, blah. A very familiar story this year — all three of New Jersey's climate reporting stations are already in the top 5 wettest years on record. 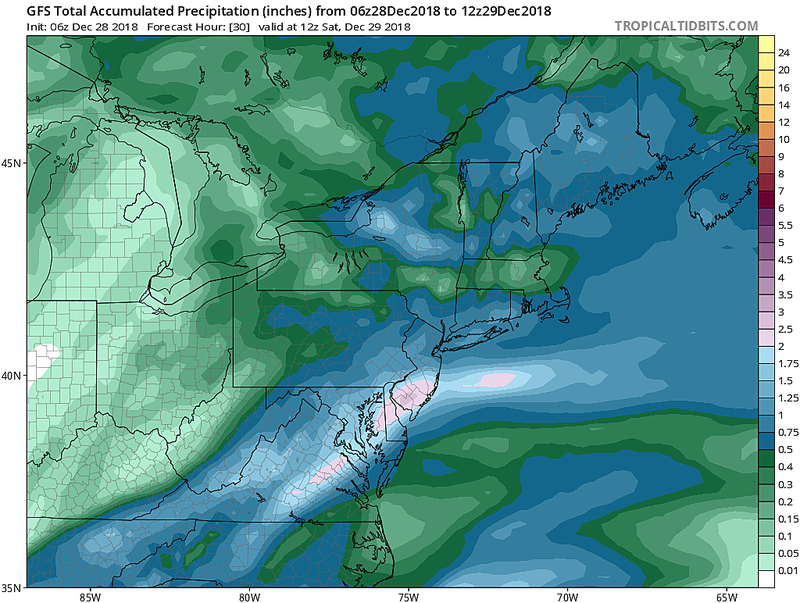 (EWR 5th, TTN 2nd, ACY, 1st) We'll pad those totals even more with moderate to heavy rain impacting the state pretty much all day Friday. As of this writing, the wet weather is already here. While there was a concern for some snowflakes falling in NW NJ overnight, temperatures remained warm enough that wintry mix was not an issue. And it's all liquid rainfall from here on out — statewide temperatures range from 36 to 52 degrees, and rising. According to the latest model guidance, I think it makes the most sense to split the state in two for Friday's forecast. Northern NJ (from Middlesex-Somerset-Hunterdon north)... Periods of moderate rain will persist through the morning and early afternoon hours, before tapering off to scattered showers by mid-afternoon. Rainfall totals about 0.75" to 1.25". Wind gusts to 30 mph. High temperatures mid 50s. Southern NJ (from Monmouth-Mercer south)... Periods of moderate rain will persist through the morning, potentially becoming heavier through the afternoon, before tapering off to scattered showers Friday evening. Rainfall totals 1" to 2", with locally higher amounts (3+ inches). Wind gusts to 40+ mph, especially along the coast. High temperatures in the upper 50s to around 60 degrees. During periods of heavy rain, both visibility and traction may be severely reduced. Watch out for big puddles too — also known as flooding. Never attempt to drive or wade through flooded areas. --Unti 6 p.m. Friday... Bergen, Essex, Hudson, Passaic, and Union counties. --Until 7 p.m. Friday... Atlantic, Burlington, Camden, Cumberland, Gloucester, Hunterdon, Mercer, Middlesex, Monmouth, Morris, Ocean, Salem, and Somerset counties. --NO watch... Cape May, Sussex, and Warren counties. 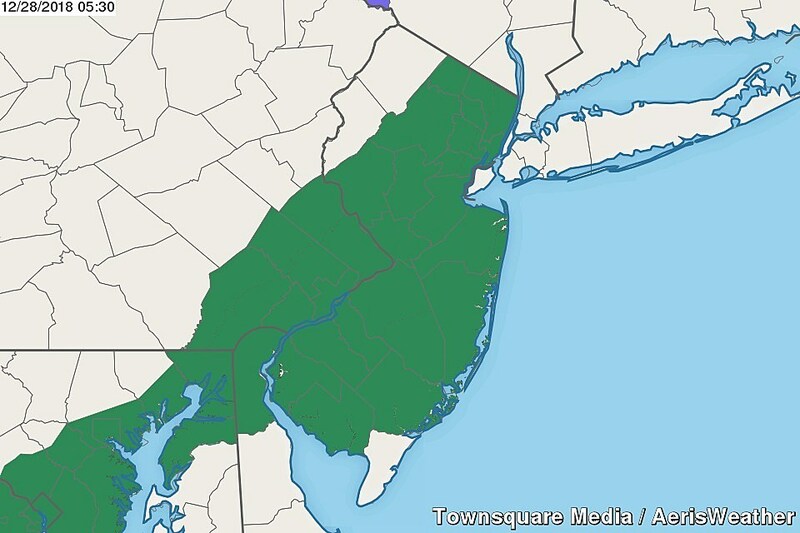 A Flood Watch has been issued for almost all of NJ until Friday evening. As scattered rain showers come to an end Friday evening, we'll see partial clearing overnight. Temperatures won't drop far enough overnight to warrant a big icing concern — we'll see mid 40s or so by Saturday morning. The good news about Saturday? It will be dry! The not-so-good news? Tumbling temperatures. A brisk northwesterly wind will gust above 30 mph, pushing thermometers downward starting around midday Saturday. While we'll see mild high temperatures in the lower 50s in the morning, we'll probably end up near 40 degrees (if not in the 30s) by Saturday evening. While Sunday will be quiet, it will bring a return to seasonably chilly weather. My latest forecast shows Sunday morning low temperatures just below the freezing mark, near 30 degrees. Highs will struggle to reach the lower 40s. Can't complain too much though — that's near-normal for late December, and we will see at least partial sunshine too. Monday is New Year's Eve. And of course it's going to rain on the final day of 2018. Unfortunately, the timeline for Monday's rain has pushed later, and may very well impact your New Year's celebrations. I'm seeing showers arriving Monday late afternoon, with steadier, heavier stuff during the evening and overnight hours. But once again, with temperatures in the upper 40s to lower 50s for the duration, it looks like a streak of strictly wet weather and not wintry weather. We rang in 2018 with a high temperature of only 20 degrees. What a difference a year makes! Tuesday's forecast high temperatures range from the upper 50s in North Jersey to the mid 60s in South Jersey. Hopefully we'll catch a few hours of quiet weather in between morning showers and an afternoon brisk wind. Temperatures will start to fall again Tuesday afternoon through Wednesday. Expect 40s and clouds on Wednesday afternoon and Thursday too. I'm still keeping watch on the long-range forecast for any threat of an arctic blast and big snow. Still nothing of note through the first week of January, although signs still point to colder air arrive by the middle of the month.